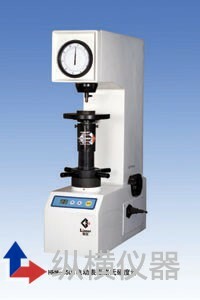 HRM-45DT Motorized Superficial Rockwell Hardness Tester adopts motorized testing method. Its testing force can be loaded, kept and unloaded automatically. Avoid man-made error and easy to use. The characteristics of the instrument is light testing force and therefore, leaving very small indentation. Surface hardened steel, copper, aluminum alloy thin sheet, hard alloy steel, zinc layers, chrome layers, tin layers, surface hardened treating and chemical treating materials, etc. Diamond Rockwell Indenter, Diameter 1.5875mm Hard Alloy Steel Ball Indenter, Large Testing Table , Medium Testing Table and V-shaped Testing Table,HR30N and HR30T Hardness Blocks , Power Cable, etc.